MorphiApp is a tablet-based CAD software that I think is a great starting point for kids or even adults who are just getting into 3D printing and CAD softwares. It has a free version and a paid version. It is only for Apple or iOS based devices for now though. But is impressive in it’s capabilities, and you can do a lot with it, even in the free version. Hey, everyone. This is Tom on the WTFFF 3D Printing podcast. 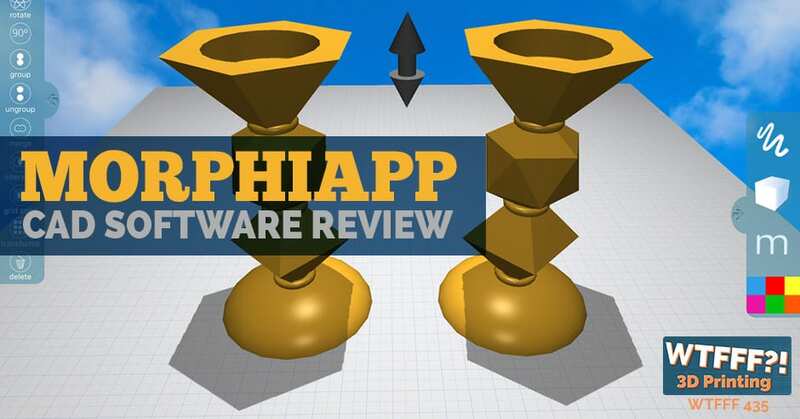 Today, we’ve got another in our series of CAD software reviews. This one is a bit different. It really surprised me. I’m quite impressed with it and I hope you will be too. This is an app for tablets, in particular, the iOS iPad Mini and the iPad app, but it’s also available for Mac, desktop and laptop OS’s as well. It’s called MorphiApp, and their website is MorphiApp.com. When this one first came across our inbox, I really was somewhat skeptical. I’m like, “Okay, another tablet-based CAD software, it’s probably going to be pretty limited, but I’ll give it a shot. Maybe it’s a good starter for students that are getting started, trying to get used to CAD.” Tablets obviously are really the gateway to computing for anyone growing up today, certainly is for my children. I have two young kids. They’ve been using tablets from before they were two years old, honestly. I don’t know if I should admit that or not, but they have. Since probably about 18 months, they have been using a tablet. They’re very used to that touch screen interface. So much so that my middle daughter, Lannea, who’s coming up on turning eight now, when I was having her learning to use Tinkercad on a laptop computer, she really had to get use to how to use a mouse or a track pad because she wasn’t really used to that. That actually presented a challenge for her getting started with Tinkercad. Actually, Tinkercad is a great software to talk about in comparison to MorphiApp because there are a lot of similarities. However, MorphiApp really goes a lot further and you can do a lot more with it, in my opinion, after using it now for a few weeks. I just went ahead, I downloaded the MorphiApp up on to my iPad. I decide to use it in the tablet, experience it first. I got to tell you, I’m really impressed with this. It’s really very intuitive and I would say quite powerful as to what it can do. 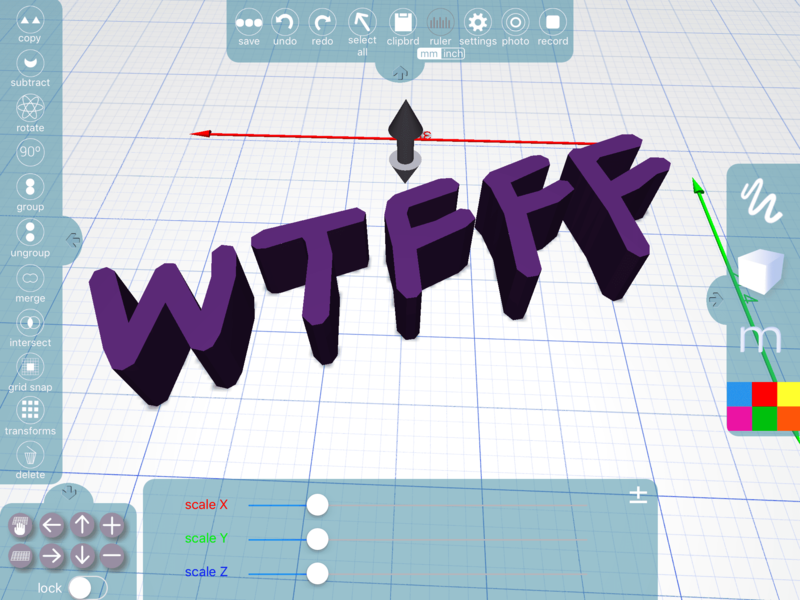 The most impressive thing to me about MorphiApp is the fact that it has, different from Tinkercad where you can just work with 3D primitives or you’re creating things completely in a three dimensional environment, MorphiApp has a 2D to 3D function. 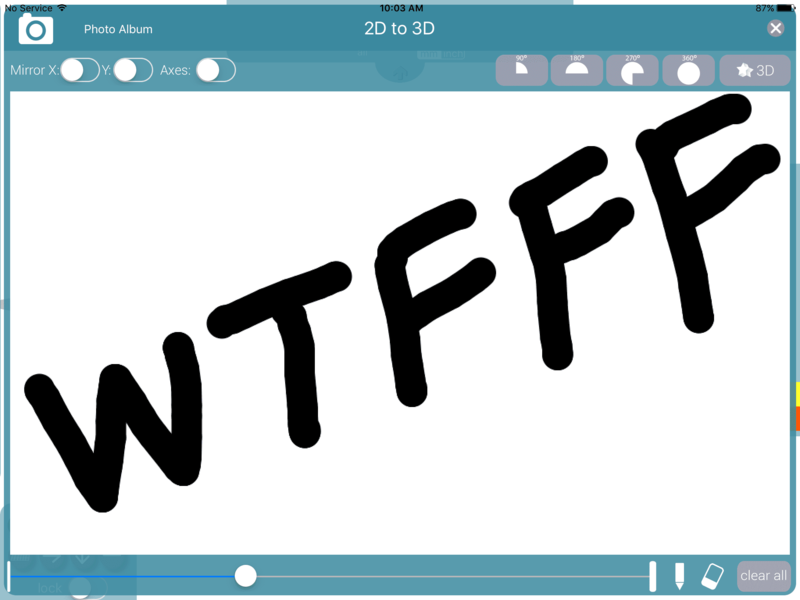 There’s this button that’s 2D to 3D, and you go into it and you can just draw with your finger right on the screen in varying brush. You might be used to using a program like Photoshop where you can just pick a different brush width and start drawing with it and painting with it. This is free-form drawing stuff, but it also has a lot of capabilities that are grounded in firm geometry of being able to rotate things on 90 degrees, 180 degrees, 270 etc., or revolve them. The point is you can start with just drawing, if you don’t want to start with a standard primitive. For instance, my daughter Lannea, for Christmas this year, has made some bookmarks. Created a model in Tinkercad, created bookmarks, used a heart shaped primitive that was there and then manipulated it other ways, subtracted some parts from it, doing some basic Boolean operations and printed a lot of these bookmarks. It worked really well. She had to, in Tinkercad, work from a 3D primitive that was there. She couldn’t just draw something that was really more in her mind’s eye. In MorphiApp, you can do that. You just draw whatever you want. It actually draws it to a specific scale and size, of course you can change that later. You hit this button once you’ve drawn what you want to. Hit this button that says 3D, and then you end up in the 3D environment and it has extruded what you drew with your free hand fingers there. If you click on it, it gives you the scale. It tells you how wide it is and how tall it is and how thick it is. It’s really pretty easy and intuitive to navigate around an object, to manipulate it, to make it taller, make it shallower, increase its scale, change it’s proportion. You can group it with other objects or leave it independent. You can do all kinds of Boolean operations. There’s a lot of transform functions that it has, obviously changing scale proportionally or non-proportionally. There are a lot of other settings. It has built in functions to export images of the object if you want and you can color them different ways. Of course, there’s a lot of the same functions that you’ve got in like in Tinkercad where it has 3D primitives, cubes, cylinders, spheres, comic section, pyramids, paraboloids, terraces, star shapes, diamond shapes, cork screw shapes. It’s just got quite a bit different functions in that regard. It has the full alphabet, capital and lower case, if you want to do something in text, which is handy for personalization. Obviously coloring of different objects, so you keep track of them. I have to say, I was so impressed that I encouraged my eight-year-old daughter, “Hey, let’s have you try this out.” She had a much easier time starting to use this program and work with it than she did Tinkercad. I think it’s because of some of the interface that Tinkercad needs and using a track pad or using a mouse, some of these things she wasn’t as familiar with when she started getting into CAD in the first place. I think if you were trying to teach a new student and you had an iOS-based tablet or computer that they can use, and that’s an unfortunate caveat out of the software as it is today because it’s not available for Android, not available for Windows machines. I know that’s probably going to kick a lot of you out from being able to or really wanting to use it. But save that, if you’ve got a young person, a student, or even as an adult that maybe you have access to a 3D printer and you wanted to give it a try but you’re not a CAD person, you don’t have a lot of experience in it, I would really recommend checking this software out because it’s really pretty easy to work with. You actually can connect it up to your 3D printer and set it to go and print. It’s got a bunch of different presets for 3D printers that exist within it, starting with Ultimaker to MakerBot, the old Replicator 2, even the 2X, the fifth gen replicators, the Prusas, and even some of the resin machines, like the Formlabs. There is a huge, actually impressive number. Even LulzBot Taz Mini, and more. The way the interface is when you choose what printer you want to use, there’s just a thumbnail picture of the printer in their settings. Then you just push on the picture for your printer. In terms of your kids or students understanding and getting used to it, that’s pretty simple. It’s got some other nice features, like you could have different backgrounds. I took a couple of screenshots of one of them that you could use. It’s got different backgrounds and different textures you can use instead of a grid floor like every typical CAD users. I know most of us probably want a grid for accuracy, but you can also have some fun with it, so that you have a more pleasant environment that you’re looking at as you’re doing your CAD work. I’m impressed. I would highly recommend it for starting out if you have iOS or Apple operating system available to you. Even as an adult getting to learn a new program, I think that this is a great gateway into more comprehensive, more sophisticated CAD programs. You could do a lot with this to get started. Certainly get your feet wet and really understand a lot of the principles involved in creating models for 3D printing and then also interfacing with your printer. If I were completely new to CAD and I had access to a 3D printer, I think that using this program would get me up and running and printing something fast, having some success with it. Because I think that a lot of people who have this grand vision of, “I’m going to go out and buy a 3D printer and then I’m going to create a model for something that I want to do or for a project at home, or something I’m doing in my workshop, in my garage or something.” When they get to that point of using CAD software, that’s where things really slow down and it gets really complicated. I think that’s also where a lot of people then say, “All right, I’m going to go out and search on the internet and find an existing file to start playing with.” That’s fantastic. There’s nothing wrong with doing that, but it does limit you to things that other people have created and what there is relevant to you just because the learning curve and the relative barrier to learning CAD and getting up and going with it. But this program, seriously within five minutes, you could create something that’s truly your own, just drawing it with your finger on here, extruding it, and then go and print it. In the simplest sense, you could be up and working, making something you’ve completely created on your own that isn’t just a primitive that somebody else has made available to you or an existing file somebody else created. To me, that’s pretty powerful and I like it. I’m a fan. Now, my seven, almost eight year old daughter, Lannea, is trying it out and using it. I’ve got some photos of that in the blog post as well. Check it out. I think even if you’re a seasoned CAD person, a lot of times people will ask you, like they ask me, “Hey, what CAD software, just to try it out, just to get into it and get my feet wet, what would you recommend?” It’s always a very hard thing. Lately, I’ve been saying, “I think a good place to start is maybe Tinkercad, then maybe work your way up to 123D or something like that.” You still can do that, and those are good products for sure. But I think right now, I may start recommending, as long as they have iOS and then you can get right in to it, I think I would recommend MorphiApp. Now, they do say on the MorphiApp website that Windows and Android app versions are still in development but coming soon. I don’t know. I don’t want to go out on a limb and say, “Hey, guys. Hang in there and wait, it won’t be very long,” because we’ve heard companies they’re going to come out with their other versions. It was a much more complex program, but Rhinoceros had been in beta for a Mac version, because it was a Windows-based program first. They have been in Beta for six or eight years before it actually came out. No promises obviously on when there might be a Windows or Android version, but they say coming soon. Hopefully, it would be sooner rather than later. We’ll certainly update you when we learn about it if it becomes available for those platforms. If you got an iOS device or an Apple OS laptop or computer, check it out. There are two versions, just so you know, available. There’s a free version which I downloaded. It has in-app purchases, so for getting it for free they may push things to you or get in-app purchases. But you can get it for free, that’s the important part, and I did it. Honestly, it wasn’t that annoying. They didn’t really push anything to me in the couple of weeks that I’ve been using it. But they have a paid version where you won’t get that and it’s $9.99. Pretty reasonable tradeoff that you can choose. You can try it for free. If you like it, then you can go pay for it. There are even volume discounts available through Apple’s Volume Purchase program for twenty or more purchases. If you were a school that had Mac computers or tablets available and you’re considering using this CAD program as a gateway for your curriculum, there are volume purchase options available. Reach out to the company for that. If you have an experience with this app, let me know, I’d love to hear about it or see what you’ve done. If not, after you start using it and you have a little experience with it, let me know what you think. I think it’s pretty cool. I’m impressed, but I’d be curious what you think as well. You can leave a comment below or reach out to us anywhere in social media @3DStartPoint. I hope you enjoyed this. It’s a little bit of a surprise for me, a new one that is pretty cool. Check it out and I hope you have fun with that. We’ll be back tomorrow with another episode. Thanks for listening, everybody. This has been Tom on the WTFFF 3D Printing podcast.